Fun & Excitement in Bayside, Queens! CAMPGROUND LOCATION - World of Discovery Summer Day Camp of Bayside, Queens is conveniently located at the John Golden Ball Fields in Bayside, Queens, NY (32nd Avenue & 215th Place). OPEN HOUSE LOCATION - Summer Camp Open Houses are located at our private pool, The North Flushing Swim Club at 141-01 32nd Avenue in Flushing, Queens, NY (Corner of Union Street and 32nd Avenue). Click above for aerial view. 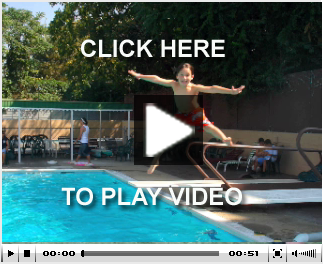 All summer day camp sports are designed for fun as well as to improve your child’s skills. At Discovery Sports Academy, our goals are simple: motivate, improve skills, enhance competitive spirit, develop team players, and have fun. Our summer sports day camp program is designed to instruct campers in the basic techniques of a variety of sporting activities and to advance the experienced player in skills and knowledge of the game. Everyone is a “super star” at World of Discovery Summer Day Camp. Campers are grouped by age and ability. Our instructors design instructional drills to enhance and stress basic fundamental techniques and practice these skills through exciting intra-camp tournaments and events. We draft every camper to become part of a team, which participates in a series of round robin tournaments in basketball, baseball, soccer, kickball, and football. If you have trouble viewing the videos on this site, please download and install a free copy of the latest Adobe Flash Player here. 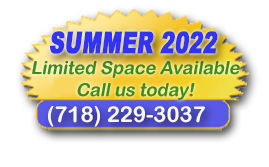 SUMMER DAY CAMP SWIMMING - Exclusive Private Outdoor Pool located in North Queens (32nd Avenue off Union Street) for recreational and instructional swimming. Most of us can appreciate how intimidating the water can be, especially for very young campers. That's why at World of Discovery Summer Day Camp our Swim Program stresses safety, fun, and most importantly, instruction by certified staff. To further encourage safe, enjoyable swimming, we rely on the "buddy system" approach. This insures that no child is in the water without a friend and safety partner. This time-tested approach is utilized in our beautiful outdoor private facility (featuring both Olympic size and kiddie pools). Campers receive swim instruction 3 days per week in 30 minute intervals, accompanied by time to practice their skills during the recreational swim. DISCOVERY SUMMER CAMP TRIPS - Campers take two-three age appropriate summer day camp trips each week to places such as Yankee Stadium Tour, Ripley's Believe it or Not, Madame Tussaud's Wax Museum, Deep Sea Fishing, Dave & Buster's, Laser Tag, the Mets Game at Citi Field, White Post Farms, Westbury Music Fair, latest summer blockbuster movies, the aquarium, children's museums, sports complexes, go-karts, historical sites, fun stations, amusement parks, skating, bowling, and other fun places that provide valuable learning experiences. One of our most popular trips is the Discovery Charters Speed Boat. Campers get an exhilarating up close and personal tour of the Statue of Liberty and many other landmarks along the Hudson River while crusing by in a state-of-art speed boat. Campers party to the latest music and enjoy the breeze as the boat explores the waters around Manhattan Island. World of Discovery Summer Day Camp of Bayside, Queens New York features exceptional supervision and amazing camper to counselor ratios. SUMMER DAY CAMP RAINY DAY ACTIVITIES - At World of Discovery Summer Day Camp of Bayside, Queens NY, the weather is no deterrent to fun! We have a large indoor facility in Bayside where the children participate in a rotating schedule of movies, talent shows, arts and crafts, sports, magic shows, bingo and many other exciting activities in our spacious gymnasium, cafeteria, auditorium and classrooms. & Friendships to last a lifetime!